Formed in the college town of Umeå in northern Sweden in 1987, MESHUGGAH have spent the last twenty plus years and cumulative thirteen releases developing, exploring, and redefining their complex, inimitable approach on the art of expressing their collective Id. 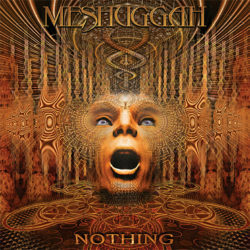 An entity that has not sounded like anyone else in over thirteen years, MESHUGGAH are one of the few purely and honestly lateral-thinking forces genuinely dedicated to pushing the boundaries of extreme music simply because doing so comes naturally to them. Unafraid to take risks and tackle new experiences, they create albums you can listen to six years later and still discover things you never noticed before. The mystical lore surrounding them pertains to their mathematical execution of odd-cycle time signatures shifting around common 4/4 time. As a result, it isn’t shocking to see some of the biggest names in metal standing in the wings at MESHUGGAH shows, shaking their heads at the band’s majestically demented, down-tuned, groove-laden, and precisely performed polyrhythms that never veer out of control. Devotees include Tool, The Deftones, Kirk Hammett & Lars Ulrich of Metallica, Rob Halford of Judas Priest, James LaBrie of Dream Theater, and Boston’s prestigious Berklee College of Music, which incorporates MESHUGGAH’s back catalogue into their curriculum, fortifying the belief that such perfectly calibrated music adds a crucial ingredient to a modern musical education.